One-fifth of the population of the U.S. is at risk from either blazing heat or dangerous flooding Tuesday. In the western U.S., some 40 million people from Washington to Arizona were under an excessive heat warning or heat advisory, according to CNN meteorologist Brandon Miller. Meanwhile, about 32 million people are under a flood watch, mostly in the East. Some of the worst heat, not surprisingly, is in the Desert Southwest. Phoenix officially broke its temperature record for the date Monday as the high reached 115 degrees at Phoenix Sky Harbor International Airport, the National Weather Service said. The previous record for July 23 was 114 degrees set in 2014. The area could reach 117 degrees on Tuesday, which will be the warmest day of the week and potentially the hottest day of the year so far,weather service meteorologist Larry Hopper said. Phoenix residents need to take heat warnings seriously: Maricopa County public health officials say 155 people died in the Phoenix area last year from heat-caused illnesses like heat exhaustion and heat stroke. [post_ads]Notorious hellhole Death Valley will see highs over 120 degrees the next few days. Night will bring little relief, as temperatures will only drop to around 100 degrees. Southern California was also locked in a pattern of triple-digit weather, and the California Independent System Operator Corp. urged people to ease off the air conditioner and other appliances during the time of peak power usage from 5 p.m. to 9 p.m. Tuesday and Wednesday. The heat is extending up into the normally mild Northwest. Portland, Oregon, is under a heat advisory, with temperatures expected in the mid-90s Tuesday through Thursday. The heat also will set the stage for a heightened risk of wildfires in the West, including Southern California, this week, AccuWeather warned. Due to smoke from several raging wildfires, the air quality in southern Oregon was the worst in the nation Monday, and the rest of the week doesn’t look much better. Fortunately, the heat will ease a bit in parts of Texas on Tuesday, a day after several central Texas cities set all-time record highs. In Waco, the temperature soared to 114 degrees, breaking the record of 112 degrees set in 1969. Heavy rains continued to drench much of the Mid-Atlantic and Northeast for a fourth-straight day Tuesday, swelling rivers and creeks, flooding roads and forcing emergency declarations. The storms are far from over. And although a reprieve is forecast for the weekend, next week could bring more misery. "A stubborn upper trough and wealth of tropical moisture will continue to impact the East with heavy rain and flash flooding through mid-week," the weather service warned. A woman in Burke, Va., just outside of Washington, was killed when tree fell on her home. The tree's roots had loosened up due to the days of rain, Fairfax County fire chief Willie Bailey told WTOP. Washington, D.C., could see its rainiest July on record by the end of the month. So far, 8.2 inches has fallen, less than 3 inches below the city's all-time wettest July, which was in 1945. Paul Walker, a senior meteorologist for AccuWeather, said a smattering of daily and monthly record rainfall totals are again likely as the storms roll through the region. He blamed a large high-pressure system for bringing tropical moisture up to North Carolina and Virginia all the way through New York state. He said some areas, already sodden with days of rain, could see as much as five or six inches Tuesday, with another blast Wednesday. But Thursday could see the foul weather slide east, bringing relief for the weekend. 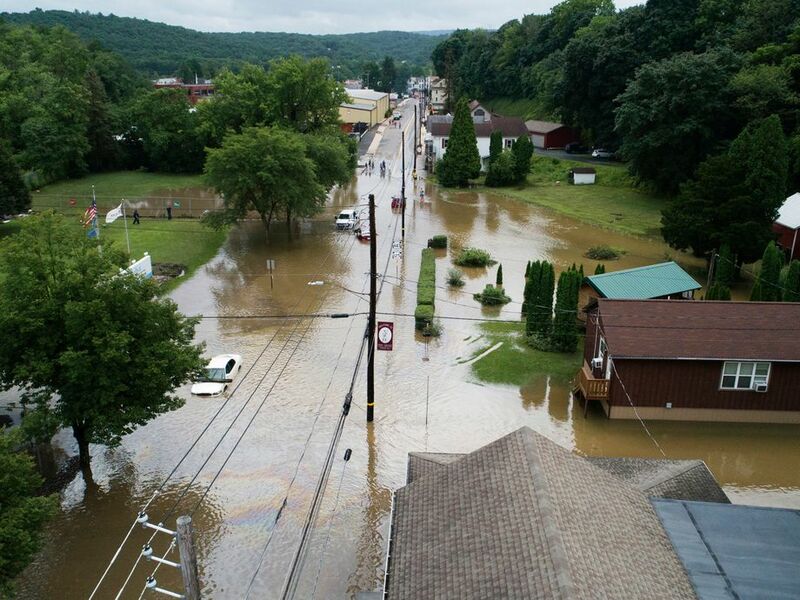 Parts of Pennsylvania were among the hardest hit areas. Some evacuations were reported near Harrisburg, the National Weather Service said. And the town of Tremont, 110 miles northeast of Philadelphia, saw rivers of water rushing through its streets late Monday. "I am asking all of the community to assist each other in this emergency natural disaster we are facing," Mayor Ricky Ney said. "Our local emergency crews, local police department, and streets crews are working as fast as they can. Please have respect for your neighbors and help out." Thirty-five miles to the south, tourist destinations Hersheypark and ZooAmerica were forced to close Monday "due to the excessive rainfall over the past three days and localized flooding." Hersheypark opened Tuesday while ZooAmerica remained closed. The heavy rains Monday and Tuesday came following a weekend that saw record-setting rainfall trigger flash flooding in Virginia and Maryland, stranding vehicles and forcing water rescues and road closures. Saturday was one of the wettest July days ever recorded in both Washington and Baltimore. Walker said a weekend reprieve was forecast. Then, more rain. "Unfortunately, looking long range, this pattern may reset itself next Tuesday and Wednesday of next week. More of same," Walker said. "Just what everybody wants to hear."